Total Tippins Takeover: santa, pink pig, and christmas cards…. 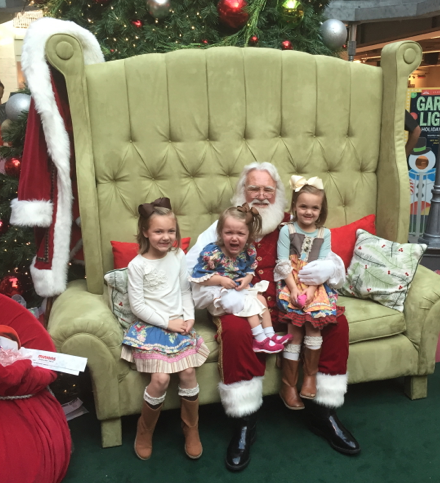 santa, pink pig, and christmas cards…. 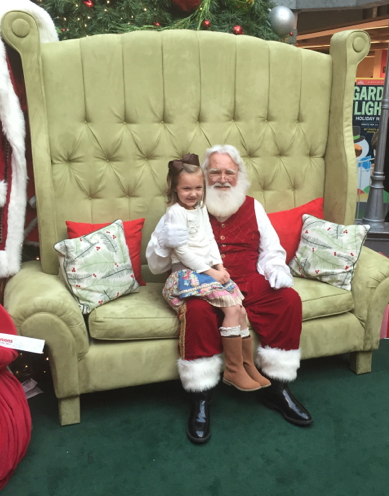 a few weekends ago, we took our annual trip to visit santa and ride the pink pig. we woke up early on saturday morning - who am i kidding? 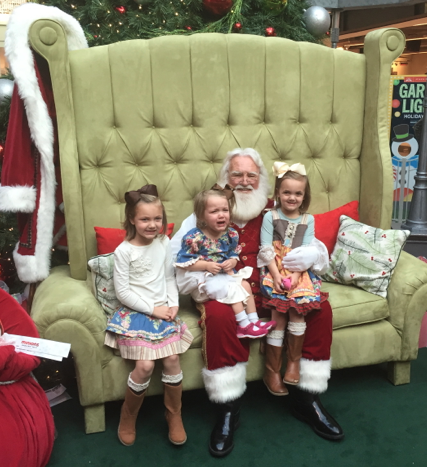 we always wake up early on saturday morning (and by "we" i mean three precious little tippins sisters) - and headed out to see santa and try to beat the crowds. 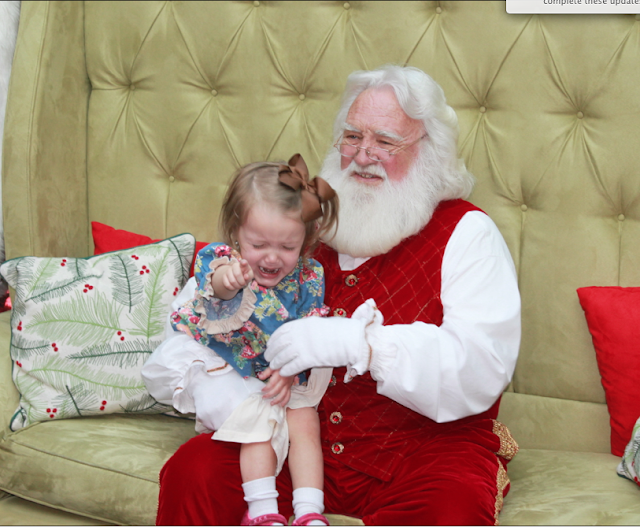 my original plan had been to go on friday morning/afternoon, but libbi made sure to tell me that "visiting santa is not a very good reason to miss school." so our plans changed and i was officially schooled on attendance policies by my six year old. nice. saturday morning ended up being just fine. no crowds and really not much of a wait. 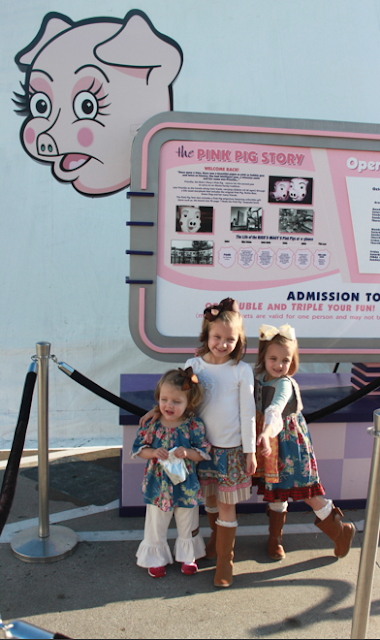 we were one of the first in line to see santa and one of the first in line to ride the pink pig. mission accomplished! 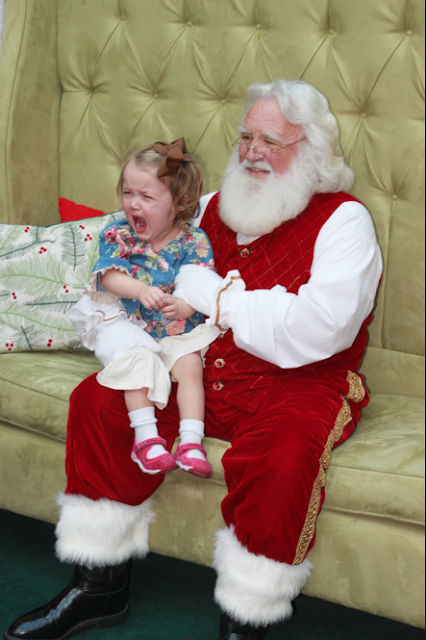 we had our first crying santa picture last year, and i was about 99.9% sure we'd have a repeat performance this year. and liza did not disappoint. after our santa visit, we went outside to ride the pink pig. since it's in a big tent outside the mall we're at the mercy of the weather. some years it's been freezing cold and we've had to bundle up, but this year was quite the opposite. 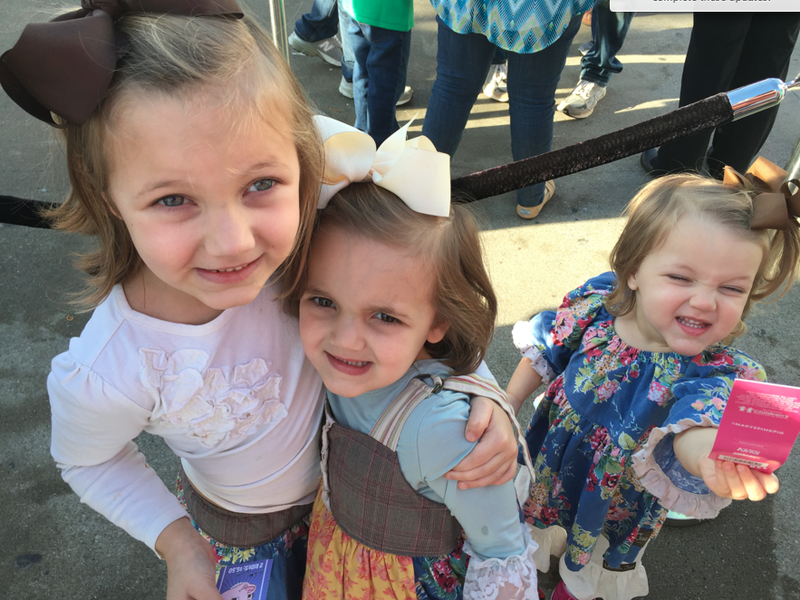 gotta love georgia winters :) we were sweating standing in the sun waiting to enter and my girls did not need jackets of any kind. 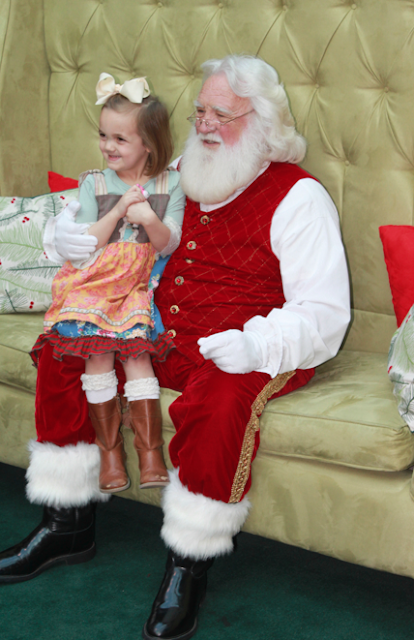 poor liza was still recovering from her visit with santa, but the pink pig was the best medicine. there's just something so oddly hypnotic about that pink hue, squealing voice, and the 1950's vibe. ha! 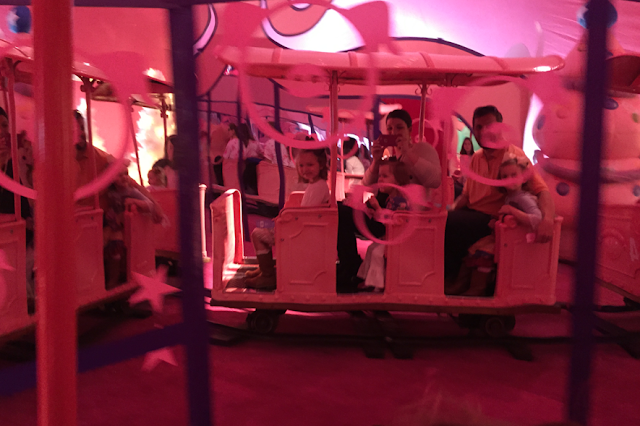 if you have never been on the pink pig, it's a small little "pig train" that you sit in and ride throughout the tent (at a snail's pace) while listening and watching a life-size story of priscilla the pig and her friends. it lasts for maybe five minutes. maybe. 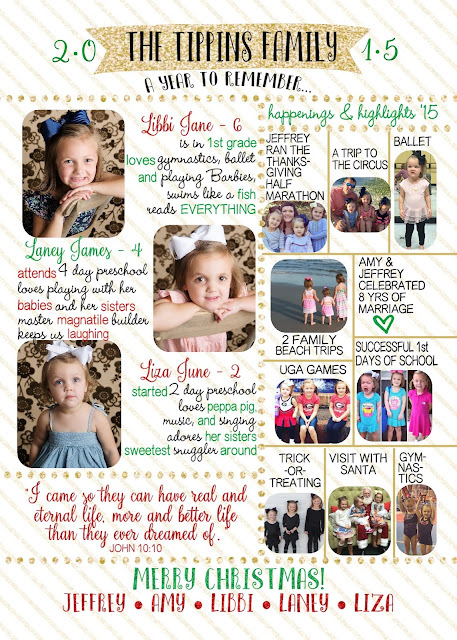 the proceeds benefit CHOA (children's healthcare of atlanta) who we LOVE, so it's totally worth it. and the girls love it. 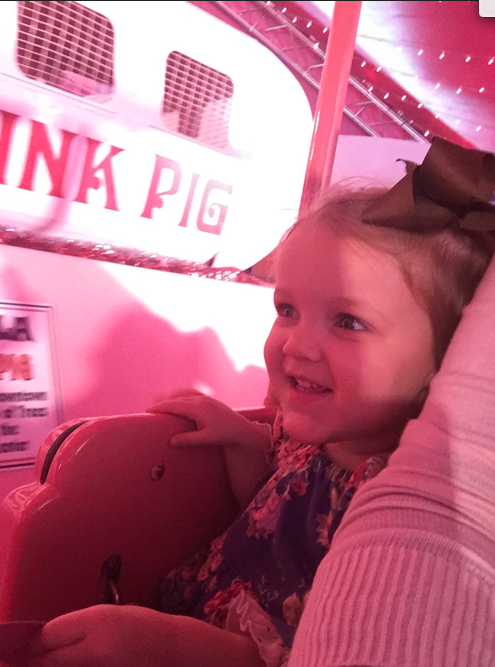 i'm thinking that sadly libbi's days of thinking it's fun are numbered, but we still have a few years left with liza and laney to enjoy the ride. and truth be told, libbi will be riding it with the family whether she thinks it's fun or not. haha. it's a tippins family tradition! family selfie :) and let it be known that libbi requested to ride alone… gotta love her independent spirit. 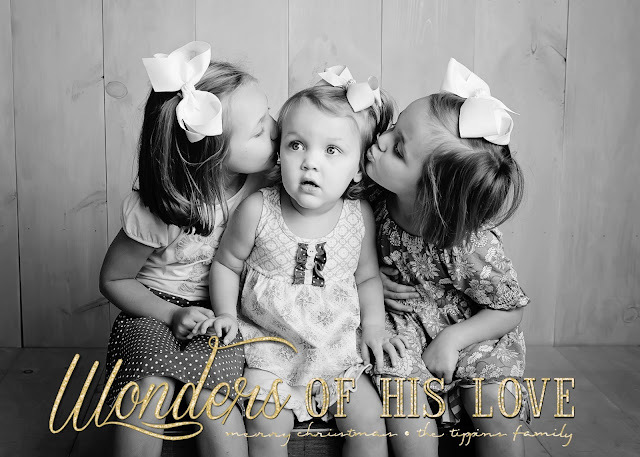 and lastly, since our christmas cards have (finally!) been mailed out, i thought i'd share it here on the blog. merry christmas from the tippins family - we are so thankful for the birth of a savior - there's no greater gift!